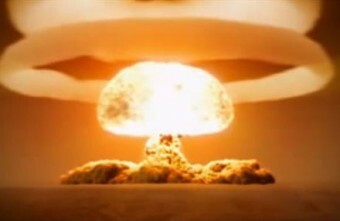 Susan K. asks: Why do nuclear bombs make mushroom clouds? What has been commonly referred to as the Rayleigh-Taylor instability was first brought to light by Lord Rayleigh in 1880. He was attempting to describe the motion of liquids when one of higher specific gravity was supported by one that was lighter. Specifically, trying to better understand how cirrus clouds were formed. In 1950, Sir Geoffrey Ingram Taylor discovered that Rayleigh’s “interfacial instability” occurs for other differing substance accelerations as well. The phenomenon, and all the equations that describe it, became known as Rayleigh-Taylors. It’s the same principle as that which causes hollowpoint bullets to form a mushroom shape. It’s a matter of resistance. If not for pressure upon the column, it would rise forever, but instead, it loses its upward momentum and falls in an arch in all directions. According to this article the mushroom cap isn’t due to downward motion. It is due to outward expansion from the center hot column. The bullet idea is not a good comparison as you are comparing a solid with a gas. They behave differently, as the gas is also influenced by heat and air pressure. The solid is only influenced by heat and motion.